If you would like to add your testimonial to our site, please e-mail it to Tom Crone. Don't forget to include your name, if you would like it shown. Disclosure: The people who provide testimonials for this website are not paid for their comments. These comments are from their personal experience. "Tom is wonderful! We had him perform at our anniversary venue and everyone loved him! He is extremely warm, entertaining, and professional. There were a lot of “wows” during his show." "Tom does a nice job. The residents enjoyed his performance." 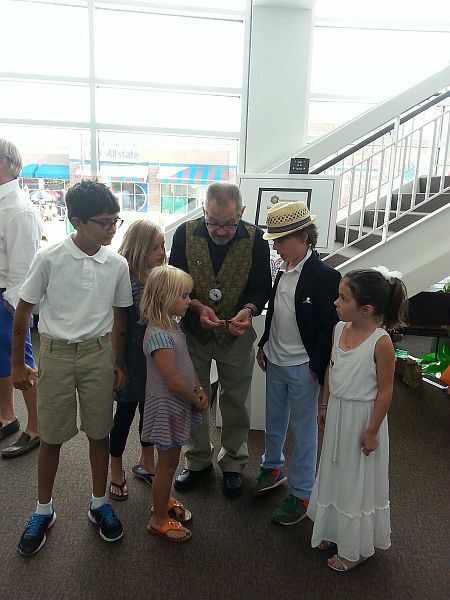 "Tom "Magic" Crone is our go to person for individual Magic Shows and for teaching our youth the art of Magic. Tom is reasonable, fun, entertaining and is always improving his act! Thanks Tom"
"In the ranks of master magicians, Tom Crone exceeds them all. On the backdrop of our Edwardian mansion, Crone ignited his audiences with period regalia, dazzling magic, and potent historical messages. The hundreds of guests who were entertained over several seasons of shows demonstrated their unanimous wonder in ovation after standing ovation. What the audiences were not able to enjoy, was that on the business side, Tom Crone was never late, always prepared, thoroughly rehearsed, and has a foundation of years in the business that shows in all that he does. We could never imagine engaging with a different Master Magician! " "Tom is an engaging storyteller, charming deceiver, and delightful performer. At any age, we need a bit of magic in our lives." "Tom Crone was a great success at our church festival! Not only did it draw a large crowd, it was a crowd of all ages, from children to adults. The performance was enjoyed by all, with rounds of applause heard. Tom was great to deal with in coordinating the ideal combination of his abilities to suit our needs, to maximize the effectiveness of his visit, and to maximize his contact with as many of the fair goers as possible. Tom had great advice from his experience, ranging from what would work best for his interaction with spectators to how to set up the stage for maximum enjoyment. Tom was a great value to the enjoyment that was had by all. Starting with a walking magic show, up close contact and impressive tricks wowed a lot of people and drummed up the excitement, culminating with a great stage show for all." "Thank you, Tom for bringing your magic show to us! Your performance was both entertaining & engaging. Our residents really enjoyed themselves. They especially thought it was fun to have the audience involved in the show." "Thanks again for providing magic fun for the St. Jude Theatre of Dreams event in June. We cannot thank you enough for the fun and excitement you brought to our guests. All of the families who attended were mystified by your magic, kids and adults alike. We're looking forward to having you perform for us again next year! Thank you so much for being part of our special event." "YOU WERE PHENOMINAL! The families LOVED you!" "Our church choir hired Tom Crone to be a "traveling magician" during our Gala Dinner fundraiser. Tom is a gentle soul who captivates watchers of all ages with his deft tricks. I would have loved to see him do some on-stage magic, as I know his craft is well honed and he is well respected in the community. " "After a wonderful performance at my housewarming party, I can say that Tom Crone's up-close parlor magic makes you feel like a kid again. He charms the crowd, makes them laugh, and then, when everyone thinks they're paying closest attention, makes their jaws drop with inexplicable illusions. If you're looking for a show that's sure to put a smile on everyone's faces, Magic by Crone is a great choice. "